METTLER TOLEDO’s extraordinarily stable, durable and easy-to-clean XPE Precision balance has been acknowledged for “above and beyond” design details that create a truly outstanding weighing experience while simultaneously ensuring excellent readability and repeatability. The innovative new balance offers excellent repeatability when weighing minute forces without use of a draft shield. METTLER TOLEDO is proud to announce that its XPE Precision balance has been recognized with a 2015 GOOD DESIGN® award. The innovative new balance offers excellent repeatability when weighing minute forces without use of a draft shield. Eliminating the need for a draft shield allows a faster weighing process and a significant enhancement of lab productivity. The Chicago Athenaeum Museum of Architecture and design in cooperation with the European Centre for Architecture, Art, Design and Urban Studies selected the XPE Precision balance from among an array of products submitted from 38 countries in areas such as electronics, medical equipment and bionics. Entries that captured the selection committee’s imagination blended elements of functionality, ergonomics and aesthetics to create truly unique user experiences. 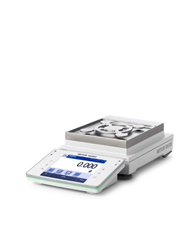 The highly unique star-shaped SmartPan™ weighing pan, which is integrated into the XPE Precision balance, fosters remarkable repeatability at resolutions down to 1 milligram while delivering results up to twice as fast as a comparable balance using a draft shield. Elimination of the draft shield makes weigh-in quicker and easier. This serves to significantly enhance lab productivity and help operators to have a more comfortable weighing process. Notably, the innovative weighing pan design even maintains a faster-than-average settling time inside a fume hood, where continuous drafts are used to eliminate the danger posed by airborne gas or other toxins. Under these subtly more difficult conditions, XPE Precision 5 and 10 milligram models in particular continue to deliver results up to twice as fast with the balance’s hallmark two-fold improvement in repeatability without resorting to draft shield use. Founded in 1950, GOOD DESIGN® is the world’s oldest and most-recognized program honoring design excellence. With the 2015 award, METTLER TOLEDO joins an esteemed list of honorees known for groundbreaking design and manufacturing excellence in their respective industries including Apple, Boeing, Google, Lenovo and Siemens. For more about the unique METTLER TOLEDO SmartPan™ weighing system and XPE Precision balances, please visit http://www.mt.com/XPE-precision. Now in its 66th year, GOOD DESIGN® is the oldest and most prestigious design awards program organized worldwide. Founded in Chicago in 1950 by the former Museum of Metropolitan Art curator Edgar Kaufmann, Jr., together with such pioneers in modern design as Charles and Ray Eames, Russel Wright, George Nelson, and Eero Saarinen, GOOD DESIGN® honors the yearly achievements of the best industrial and graphic designers and world manufacturers for their pursuit of extraordinary design excellence.